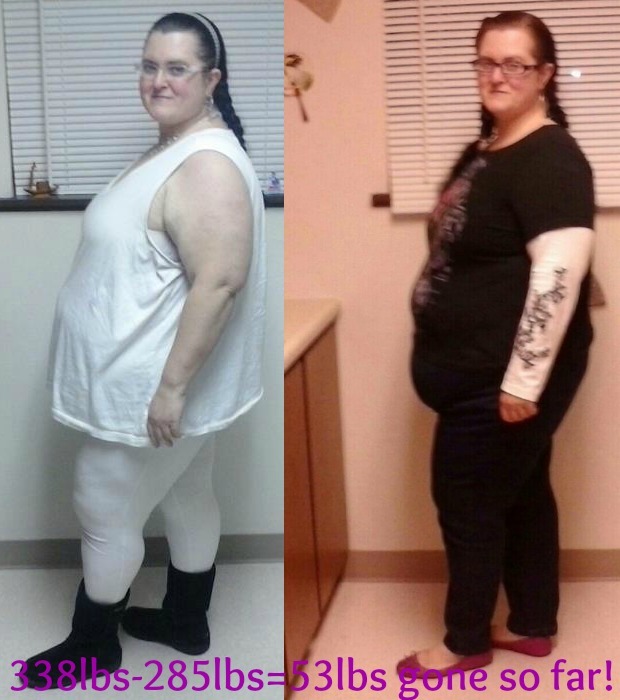 Weight 274lbs = 64lbs gone! Although I only lost one pound last week, I consider it a small victory as I cheated a few times. I will do better this week. They weren’t even big cheats. I also did not have fish at all last week. Planned fish for tonight. I think I’m gonna use up what I have in the freezer before buying anymore groceries. I’m also dealing with a lot of mental issues and doing my best to get through them. And my sleep is disrupted again. Weight 285lbs = 53lbs gone total! Finally broke the 50lb mark! So exciting for me. Although I don’t see it much, it’s definitely true. None of my clothes fit. In fact, I decided to sell my clothes on ebay to get the money to buy myself a Kindle Fire. I figure that it’s a great reward. So, here’s a starting weight to now picture for you guys. And make sure to follow the link to join the facebook page for this site. Just put stuffed green peppers in the oven. Excited to see how they come out. I will post a pic and the recipe online under Lean & Green recipes. So, here’s the update with the Mel situation. He said he was coming up after wanting to apply at a place I referred him to. He got a hotel that was way far from me. Then, when I said let’s meet, I have the next few days off, he said it was too late and pouring rain, he would never find me. Anyone that knows where I live, knows it is super easy to find. And it was not raining, in fact I have only seen it pour a few times since I have been here. It was only drizzling. And it was only 6pm. So, I blew it off and he said he needs to get a hotel on my side of town and he needs me to take him to the place to apply the next day. So I told him when I would be awake, gave him my address and went to bed. I texted him when I was awake with no response. I waited for him to respond for an entire day. When I heard nothing, I texted him one last time stating that this was the third time I have cancelled plans for him and I just don’t know what to say. I have never heard from him since. I’m not sweating it though. I wasn’t completely sure where this was going anyways. And I have many things to focus on. So, I’m not getting down. Definitely won’t forget him though. Had a terrible gout flare up last week. It had gotten so bad that I couldn’t put any weight on it. Even sitting down, it throbbed terribly. One night, I gave up and couldn’t take it anymore. I took every pill I could get my hands on. But not too much of each. No more than the recommended dose. Two percocet, two naproxen, two vitamin D, and two cholcrys. Praise God, it worked. Now it’s just a dull ache. However, it upset my stomach so bad that I was getting sick at work. But now, it’s all good. Feelings….dull pain, lots of energy, feeling healthier. I completed alot of changes to the blog for a better look and flow. I included a Definitions and a Links page. Please know that if you need help, please don’t hesitate to get some. You are not alone. Email me if you like and I will do whatever I can to help. I intend to update the rest of the Surviving the Different Abuse guys, one a day. That’s four more posts. It’s hard for me to write them. Although I know it is healing for me to do so, it is just hard to get my mind to remember everything and not upset myself. So please bear with me. I did a bunch of cooking today to prepare things for my work week. Things should be easier now. Praise report! I got hired at a Christian company doing the same work. This will be a more medical group home and the violence will be gone. I am so grateful for that. I think I was getting too old for the violence. The only issue is that it doesn’t start until February 25th. That is quite a ways off. I guess I just stick it out until then. Got some of my tax forms in the last few days. Looking forward to getting that going. Prayers….no more violence at my current job, a rise in integrity at work, Paul to get a better job as well, that these posts will help not only me heal as they are doing, but for them to help others as well, that You can show me how to use these experiences I have been through to help others. Did alot of adjusting to the blog to make it better. Hopefully this helps. It seems the more I study and learn about blogging, the more changes I make. I decided last night to help Paul make some money by offering him a percentage in selling some things on Ebay for me. So we agreed on him receiving 40% of profits of everything that sells that’s mine and 100% of what he sells that’s his. Hopefully this helps us get some spending money. Then, we went through the storage area and found tons of things to sell and give away. Got all my pictures backed up on Snapfish today as well. This took forever as the computer kept freezing up. I figured out why too. Stupid Skype settings wouldn’t change and kept crashing. So I tried uninstalling it and failed. Paul succeeded. I’m no longer feeling hungry all the time. I only get hungry when it is close to time to eat. That’s kinda cool. Also, I don’t feel cravings. Day two of the diet and I’m still gassy and crampy in my lower abdomen. Everything I read says the pain will stop, it’s just temporary. We will see. Today was easier overall. However, I ran into one bug. The math of when to eat required me to eat 7 times instead of 6. I realized that this is gonna be hard to accomplish with my crazy sleep schedule. I work varying shifts and sleep speratically at times. Everything I’ve seen online tells me to never go over three hours without eating. So until I hear back from my coach, that’s what I will do. All this healthiness has got me thinking on more ways to improve my life. I decided to post stickys to remind me of oral health habits and calendars for me and John individually to schedule cleaning and see each others schedule. I hope this helps. Paul got a job at Burger King. Hey, at least its a check. He starts on Monday. Mel has been telling me he loves me. I’m still not sure what is up with him. He is very private and seems to show no interest in what I like. Confusing. This I leave in God’s hands. I started my new life today. I’m so positive that it will work and change my health and moods. I ate 6 times today and drank 12 glasses of water, as well as a 20oz coffee. After and during all that I was still hungry and my stomach growled. By the time I had my salmon, asparagus and spinach, I was craving real food terribly. It made the food taste better. I’m trying to change my food thought process to reflect food as a necessary source instead of flavors to ate whenever. The funny thing was, by the end of the day, I had so much energy I didn’t know what to do with myself. And I was happy. Weird but cool. Looking forward to major changes. I will be updating this weekly with thoughts and weight. Take Shape For Life (TSFL) is changing my life.